The idea that the conformation of the receptor-bound arrestin is dramatically different from that of a free arrestin in solution emerged soon after the discovery of the first member of the family, visual arrestin-1. However, most of the evidence for this emerged in the last few years from studies using biophysical methods and X-ray crystallography. The similarity of the conformational changes in different arrestin subtypes detected by various methods suggests that these rearrangements accompany arrestin “activation”, i.e., the transition into the high-affinity receptor-binding state. The key changes include the release of the arrestin C-terminal tail, the twisting of the two arrestin domains relative to each other, and the changes in several flexible loops in the central “crest” on the receptor-binding surface and elsewhere in the molecule. 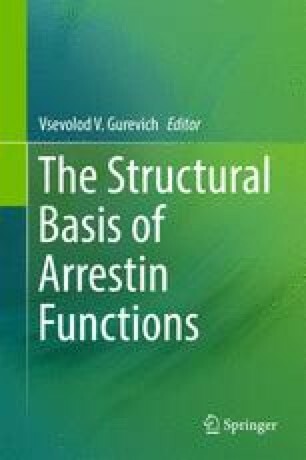 From a signaling standpoint, the changes on the arrestin side not involved in receptor contact appear more important, as they allow the non-receptor partners to discriminate between free and receptor-bound forms of arrestins. The identification of these changes facilitates elucidation of the structural basis of arrestin-mediated signaling, including mapping the binding sites for various signaling proteins. This work was supported by the NIH RO1 EY011500, GM109955, GM077561 (VVG), EY05216 and the Jules Stein Professorship Endowment (WLH), and Canada Excellence Research Chairs program (OPE). OPE is the Anne and Max Tanenbaum Chair at University of Toronto. We thank Dr. Ned Van Eps for comments on the manuscript.